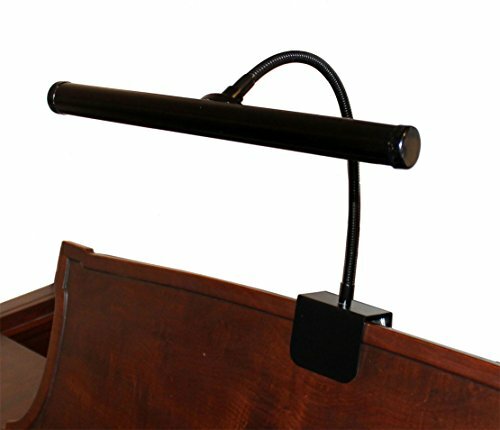 This black LED piano lamp features a 12" wide shade, with an extra long 11-3/4" inch flexible gooseneck--allowing the pianist to get the perfect lighting angle for their situation (note similar lamps only use an 8.5" gooseneck). The base of the lamp measures 2-3/4" x 2-1/4". The adjustable clamp is lined with a soft rubber pad to prevent damage to your finish, and clamps snugly onto the music desk (music holder) or onto the top of your music stand--so that the light is directly over the music. Cord length is 60 inches. An elegant, classic design, this lamp is great for both upright and grand pianos. This piano lamp features LED lighting technology, which provides over 30,000 hours of use (two hours of use per day will last 41 years!). LED lamps are also energy efficient, using less than half the electricity of traditional light bulbs, and provide light that resembles natural sunlight (making it easier on the eyes). LED lamps also run cool, and do not produce the heat of typical lamps, making for a more comfortable playing experience, as well as protecting the finish of your piano. If you have any questions about this product by SheetMusicNorthwest, contact us by completing and submitting the form below. If you are looking for a specif part number, please include it with your message.